Guest Blog: Jeff Smulyan – From Consumer Electronics Show to Canadian Music Week, NextRadio is everywhere! 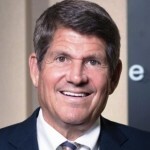 Jeff Smulyan, CEO of Emmis Communications, shares how the app NextRadio can make the listening experience more interactive for radio fans. For many years, we have been working on the activation of the FM radio in smartphones on behalf of the American Radio Industry. Most people don’t know that every smartphone sold has the capability of receiving local FM radio. The importance is that unlike streaming, the public pays no data charges when listening over the air through the activated FM radio in their smartphones. Currently, the American public listens to local radio for over 9 billion hours on various streaming services, and they are paying for all of those hours in their data bills. The same data usage applies to streaming services in Canada. In addition, listening over the air drains cell phone batteries at one fifth the rate as listening to the exact same content in the streaming networks. Further, in any emergency, when the power grid goes down, all phone use is lost. With the FM radio activated, listeners in any emergency would have a radio that can provide life-saving information on the device that is constantly with them. But for the consumer, the most exciting part of FM radio in smartphones is the interactivity that we have brought through NextRadio. NextRadio is a free smartphone app that combines your local FM radio broadcast with the internet to create a visually engaging, interactive artist and advertising experience. With NextRadio, watch music and talk come to life with album art, station logos, and song and show details. You can use the app’s Live Guide feature to see what’s playing on stations in your area in real time or browse stations by genre or frequency, set your favorites or view recently played stations. NextRadio also offers one-touch call in or text the shows that you love, buy the song while it plays on the radio and share with the station whether you like or dislike the song being played. When compared to streaming music, NextRadio gets 3x better battery life and uses nominal data. While listening to your favorite local radio station through NextRadio, if the artist playing on air is scheduled for an upcoming concert, you can buy tickets, add the event to your calendar and even get directions to the venue. When ads are running on the radio, advertisers can create a simultaneous visual interaction with the customer. Websites can be accessed, coupons downloaded and events can go immediately to your calendar. If the radio station wants to do contesting, prepopulated texts are built into the system. Nearly every component of the station’s broadcast can become visual and compelling. Currently in the U.S., we have a relationship with Sprint that involves preloading the NextRadio app on 30 million smartphones and the effort is now moving to other carriers and manufacturers. HTC phones available with all major wireless carriers have allowed the activation of the FM radio within the phone which makes use of the NextRadio app possible. Also Motorola’s affordable Moto G and Moto E phones are available at many carriers as well, making NextRadio more accessible than ever before. There are over 1.4 million NextRadio app downloads, a number that is experiencing double-digit percentage growth every month! Over 11,000 FM radio stations are being listened to with the app, and there are over 2 million hours of listening. We have found that NextRadio grows radio listening. Stations listened to with the NextRadio app are averaging 16 minutes of listening time– over 50% higher than the traditional radio average here in the United States. Also designed as an automotive radio platform, NextRadio has enabled new features for the “Connected Car” dashboard. Recently, we shared booth space with iBiquity’s HD Radio at the International Consumer Electronics Show (CES). At CES, we launched our first joint product with HD Radio demonstrating the benefits of interactive digital radio in a connected car. The demonstration platform is the first combination of both analog and HD Radio broadcasting with NextRadio services. It showcased the benefits of the connected car combining free over-the-air broadcast radio services with the elegant visual and digital capabilities of the NextRadio app. The combined technologies will deliver a highly personalized and contextual suite of services to the car radio platform enabling a level of engagement, programming information and interactivity never before available for local radio services. Every automotive OEM and Tier 1 supplier we met with at CES has requested that the NextRadio platform move quickly into their development plans! Based on our growth and success in the U.S., broadcast owners in Canada have reached out to us to provide them information for how they can bring NextRadio into Canada. Our team is also working to align smartphone providers and data carriers so Canadian consumers can benefit from FM radio enabled smartphones and car applications. I am looking forward to being a part of the Canadian Music Week and excited to be a panelist during the radio session, “The Future of Radio” on Thursday, 5/7 at 11:40am. Widely recognized as one of the most visionary leaders in the radio industry, Jeffrey H. Smulyan serves as Founder and Chairman of the Board of Emmis Communications Corporation, an Indianapolis–based radio and magazine publishing company with operations in nine U.S. markets. For 11 years Mark was a Vice President and Research Director at Jupiter Research (later acquired by Forrester Research). In his role as a music analyst and senior research manager, Mark worked right across the digital music value chain, with all the leading digital music services and technology companies, the major record labels, rights bodies, retailers, hardware companies and telcos. Mark is now the co-founder of MIDiA Consulting, a boutique media and content focused insight and innovation consultancy. Why Doesn’t Radio “Talk” To Women? Radio is an industry that pioneered entertainment content by and for women. Soap operas began on radio, after all. And later, talk shows from the likes of Dr. Laura and Dr. Ruth and Sally Jesse Raphael spotlighted radio’s incomparable ability to be intimate and one-to-one even as it’s one-to-many. But does radio “talk” to women today? In a sense, yes. After all, pick any strong CHR or Hot AC morning show and you have what is primarily “talk” for (and sometimes by) women. Sure, these shows often contain music, too. Who ever said today’s woman wants only chit-chat from their favorite radio station? The balance between conversation and music is a beautiful dance in which there is room for both partners. But it’s no secret that most of these shows – nearly all of them, in fact – are driven by men. Hey, how many men are hosting ABC’s The View? Okay, I’m certainly not going to argue you can’t have men in the mix, but do men have to be in every mix? And do they always have to be the drivers? Sure, there have been some experiments over the years, but too few and far between, and too often planted on AM stations between male- and older-skewing political wonks like Hannity and Limbaugh. Good luck developing a younger, female audience on that platform and in that particular conservative, prostate-impaired political sandwich. What’s more, too many of our experiments have been pegged as “radio for women” as if women are some weird subculture like surfers or skate kids. It’s as if we sighted Bigfoot and we need to mold a cement footprint, stat! I just don’t get it. We’re talking half the population here. And it is the half that advertisers want the most. Isn’t it in radio’s interest to address this problem? And doesn’t radio uniquely have the skills to do so compared to, say, Pandora or Spotify? The last time I was in a room of executives talking about CHR – an abjectly female-oriented format – the entire room was full of 50-something guys. Now I’ve got nothing against 50-something guys, but it’s surely not the same as a room full of women. Women are not a demographic oddity, they are simply people with their own sets of concerns, wants, needs, and interests – many of which are different from those of their brothers, sons, fathers, spouses, and program directors. CHR morning shows do a pretty good job of addressing what women are interested in – why do we cease understanding those interests the minute we try to create a conversation-based format for them?! Why have we forgotten the lessons of Dr. Ruth and Dr. Laura and Sally Jesse Raphael? Why do we ignore the lessons of Elvis and Ryan and Kraddick in dayparts that don’t rise with the sun? What if we learned the lessons about what women want from our morning shows and extended that across the whole day, keeping in mind that radio fulfills different “jobs” for listeners as the day goes on? What if we envisioned a “talk” radio station built for women’s interests that wasn’t only “talk” but also music? In my humble (albeit male) experience, women want to be listened to more than talked at. Or what if we just let women create content that women like, crazy as that sounds? It may not snugly fit the format called “Talk” or “CHR” – but it may fit an audience that’s hungry for content and attention they can call their own. In other words, what if we thought about women first rather than formats first? Women as people rather than targets? The fact that I’m even writing a piece like this is, in equal parts, embarrassing and humiliating. Because I suspect any woman reading these words is alternatively pounding her fist on the table and rolling her eyes at the sheer pathos of the male of the species, myself included. Sorry! It begins, as always, with personalities. Personalities who can connect in the way an audience wants to connect. So what do women want, you ask? Are you really asking that question? Okay, then. Begin by asking your spouse. Okay, show me that station. I dare you. And here are a hundred more women-oriented sites from Forbes. If radio doesn’t “talk” to and with women, then some other medium will. Already, many other media are. Give half the population the credit and the content they deserve. Your advertisers will thank you. Want a research partner to help you figure this out? Call me. I’m all about it. Mark Ramsey is a veteran media strategist, researcher, and trend-maker who has worked with numerous media, publishing, and digital brands. Ramsey has consulted with and delivered projects for numerous media, publishing, and digital brands over his career, including Apple, Clear Channel, Pandora, CBS, Bonneville, Sirius XM, U-T San Diego, EA Sports, and more. 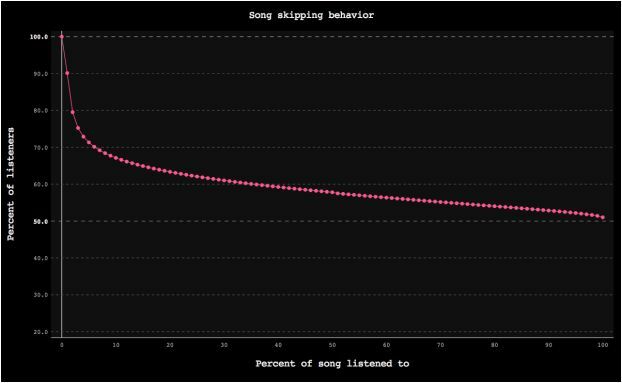 When You Stream Music, There’s a 24% Chance You’ll Skip a Song Within the First Five Seconds. This Isn’t Good. Streaming services such as Songza, Deezer, Rdio, iTunes Radio, Spotify. They all and all the rest of them are hamstrung by a series of licensing regulations demanded by the rights holders. If you use any of these services, you’ll know that you have the ability to skip (usually) up to six songs in an hour. That’s one of those licensing demands. Even though the ability to skip is limited, this is still an opportunity to study the behaviours associated with skipping songs. Check out this graph published today by RAIN and created by Paul Lamere, who works for music data company The Echo Nest (which is now part of Spotify). The y axis measures the percentage of listeners while the x axis is the percentage of the song heard. I find this interesting and a bit disturbing. 1. It shows that people have little tolerance for something they don’t want to hear or avoid because it’s unfamiliar/weird/something they don’t like/something they don’t want to take the time to learn about. Almost a quarter of users judge a song on its first five seconds. Is this an indication of the dumbing down of the music fan? 2. If this behaviour persists, how will the industry and songwriters respond? How will they try to keep people listening for more than five seconds? Radio Listeners: Is “Free” All That Matters? These are the well intentioned folks in the radio industry who believe that listeners do not have their own best interests at heart. That listeners are, as a group, a bit dull-minded. Thus, listeners must be marketed at and advertised to in order to convince them of what they surely would be better off knowing: That free radio is better than any other radio-like alternative simply and primarily because it’s free. People still don’t understand the difference between streaming and the over-the-air signal…streaming drains a smartphone battery three times as fast as an FM chip. We know there are billions of hours of listening to local radio stations on data networks. If these chips were turned on, every American could listen to the same content for absolutely free. Just look at the research: Every time people understand it, they fall in love with it. Leave aside that this is not what the research shows at all. It’s also not quite logical (a chunk of streaming happens well outside the signal radius), nor is it what the actual behavior of consumers who have access to FM-enabled mobile phones seems to show (the uptake of these devices is tepid). Nor is it even what the usage for NextRadio itself shows, if the relatively meager average listening audience is any measure. The premise wrapped up in this statement is that “free” is an argument-stopper. If only consumers understood that radio on their mobile devices could be free, they would “fall in love” with the idea. Tell this to the consumers who buy water in bottles rather than pour it from the tap for free. Tell it to the consumers who pay for cable TV rather than watch over-the-air TV for free. Tell it to the consumers who buy their songs on iTunes rather than steal them for free. Tell it to the consumers who ride bikes in a gym rather than on the open road for free. Tell it to the consumers who shop at a supermarket rather than grow their own food for free. Tell it to all of us who see “free” as one measure of value but not the only one. Recognize that we know what we like and what we want and we are prepared – happy, even – to pay for it. “Value” is a bundle of attributes, and “price” is only one. Let us decide if it’s worth the price or not. A couple of interesting comments since this post was published. The first argues that while “free” is certainly not all that matters, it is a big tie-breaker for “like” products, with the dominance of YouTube being a good example. Sure, I say. But another way of describing “like” products is with the term “commodities.” In other words, the more alike everything is the more advantage there is to be “free” since, by definition, there’s nothing else that differentiates the offerings. But is this our goal? To be the least costly audio commodity? That sounds like a very vulnerable place to me. Meanwhile, this is not a game for radio stations alone. We assume, for example, that Pandora is viewed by consumers as “costly” due to bandwidth, but I don’t believe consumers see it that way. If you ask those who are not on Pandora’s premium plan whether it “costs them money” to use Pandora, I think the vast majority would say “no.” That is, Pandora is viewed as “free” or very nearly so if we spread the “costs” of bandwidth across every application we use that bandwidth for. So when it comes to “free,” checkmate. It’s telling that cable operators and TV producers never proclaim the virtues of “free,” even though their over-the-air platforms are even more beneficial to consumer data plans than the over-the-air platforms of radio broadcasters. The second comment came from a Christian radio broadcaster who explained that his station, in fact, is not “free.” Indeed, they depend for their support on their listeners, so they consciously design their products to be “unlike” other “free” offerings so as to make them worth sponsoring. Exactly right! This is the second in a series of JJ Johnston’s “Take Five” articles designed to help deal with the rapid pace and ever constant changes in business today, and the challenges that come with them. In part one of the series we talked about the tectonic shift in business today. There is a new world out there. A few are doing what many used to do. Over the next twenty years, one thousand Canadians a day are turning 65. The old guard is retiring or being retired, offering a plethora of advancement opportunities. Many are being promoted into new positions, but not always given the training, coaching and mentoring needed to set them up for success. There is a critical need to revisit the tool box, and find new techniques to cope and thrive in the new reality. Last time, I detailed the importance of a commitment to self investment and suggested the idea of a “Personal Board of Directors” support team. I also spoke to the value of professional talent which many are utilizing these days. True performers recognize the importance of “sharpening the saw” and through this process often an edge they never even knew they had. Here are more thoughts to help with dealing with new and complex realities. Focus on the right things. You are working in multiple markets, often from dusk to dawn and pulled in many different directions. You may be finding it increasingly difficult to focus on the right things. Do you honestly know what right things are these days? And, even if you do, it can be easy to forget them or lose attention to focus, especially during crisis situations. Discuss regularly with your leader to make sure you are both clear on the ever changing priorities and hyper focus on them. Write the focus items down on paper or on a white board to keep them visible at all times. In a busy world, spending time with your team can take a back seat. Avoid this shortcut. E role clarity is some of the best employee time you can spend. Just like you, everyone needs to focus on the right things and be crystal clear on job descriptions and expectations. This will take a bit of time up front but will save you a lot more time on the back end. Involve employees in the clarity process. Ask them to provide you with an updated version of their Job Description. You will quite often find they are focusing in on what they like to do, not necessarily the important things. Negotiate the expectations together, finalize, sign off and follow through. Initiative truly kicks in when one truly understands their accountabilities. Empower your people. We all get promoted because we get things done, and new or inexperienced managers are prone to be doing everyone else’s work. I once walked into a department with a few simple operational questions and was told “you will have to wait for so and so (the manager) to come back from lunch”. Remember these were very basic things that everyone should have known. I said “why”. The response was “He/She takes care of that”. My immediate thought, and I was right, was they were working for a top down manager who was uncommunicative and possessive and in turn carried most of the accountabilities in the department. Operating with employee exclusion expedites the path to lethargy, insurrection, high turnover and/or manager Flameout. The overly-empathetic manager is hesitant to hand off more responsibility to employees and taking up more of their time. Intentions are good, but this thinking leads to resentment when your employees are not allowed to perform their function and try new things. The insular, autocratic or inexperienced manager may feel it’s just as easy and quicker to do it themselves. Lack of respect, trust, and wasted employee growth opportunities are results of this thinking. Some managers may be concerned the staff has different ideas theirs and they will get in the way of getting things done. They ram their ideas through. What is the issue? The manager is likely not inclusive, and in a sense the presentation is an “order” to follow “his/her” plan. Lead this way and people resent your plan, haphazardly manage it, and the accountability all comes back to you if it goes wrong. Nobody washes a rental car. Engage your whole team, let them own their functions and they will participate heartily. Take some of the load off your sagging shoulders and place it where it belongs. Keep the onus on them. This renders big rewards for both of you. When someone comes by to tell you about a problem, refrain from saying “How can I help you” or “Let me fix this for you”. The “I” and the “me” in those phrases squarely put accountabilities back on you. Practice asking these questions in those situations: “What you do you think you should do?”, “What are the solutions you are contemplating?” The key word is you. “I don’t know, you are the boss” is a likely response from employees who have been in a long time top down situation. Answer back: “I know you have probably been thinking about a few solutions. What’s coming to mind?” And then say nothing (crickets). Listen. Encourage them to go forward with their ideas, and make sure they know you have their back. Chances are their solutions may have crossed your experienced mind. Be very careful not to inadvertently take credit. Refrain from statements like “Good idea. I was thinking the same thing” or “Yes I thought about that solution too”. Those are huge deflators and destroyers of the trust you are building. If they are stuck, communicate that you will help them out this time, but in the future you would like them to come by with solutions. They ultimately want the accountability and it’s important for both of you to put it back on them. You know you have a home run when someone comes in to tell you about an issue, how they’ve pulled it apart to determine the cause, and proudly explain the concrete solution they have moved on. Avoid reverse delegation. I have always been a fan of getting the team together for brainstorming. In the early days of my leadership career, I tried to get the best of their ideas going but in a hectic and multitasking world it was not possible to get around to them all. Once, in a one on one with an employee, I was told the meetings were a waste of time because the ideas were never implemented. From that point forward when people came to me with on-strategy suggestions, I would put it back on them. I’d say “Interesting idea, how do you want to proceed with that?” At first they would say “I brought this to you to get done because you are the boss”. My response was “You are right. I am in the management role and as you know there are many things on my plate. an interesting thought. Why not try and bring your idea to life?” Staff would either go out and do the valuable homework, or forget about it. They could not say there was a lack of follow through. Again, put the onus back on them. You are not paid to do their work and strong performers do not want you to do their work. Clear placement of accountability renders great results for your team and for you today. Practice these techniques but be patient. This is not a quick fix, but if you are committed you will find your teams and yourself more engaged, productive and happy. In future Take 5 “Avoiding Flameout “columns, we will discuss the of Priority Management and The Fine Art of Delegation.